I know children normally make indoor tents/caves/dens out of sheets and blankets, but Aaron's yet to do that, and we don't own a wendy house or pop up play tent. BUT he does like being intrepid and finding places to climb and hide within the home. His favourite place to hide and climb is behind the sofa. We have an L-shaped sofa up against the window, and instead of positioning it as an L, it is more like a V, thus creating TWO corners. Aaron is often to be found in one or other of them. Bless him one of them is now taken up by the Xmas Tree, so that's one of his Den's gone!!! Yesterday when I was putting the tree up I had SO many toys to remove from that corner, and thank God I now own a DC59 Dyson, as I would never have been able to get in there with an upright vacuum cleaner. Anyhow, this was Aaron's latest effort at climbing/hiding and creating a den. He climbs in and out of the cot with ease, even though he never sleeps in there (only did so for the 1st six months of his life - coslept ever since). This is my entry for Britain's Best Blanket Fort Competition. I know Aaron is ON the blankets instead of under them, but that just means they provide the floor of his fort yes? ;-) Also, seems apt that Aaron's fort is made out of furniture, when this is a furniture company's competition. He loved that he could hop in, and slide the roof across, and that he could then hop out the other end. Yes, I know our nappy changing thingy has become a dumping ground..... I am a complete hoarder and clutter bug :-( one of my afflictions. I will deal with it at some point. 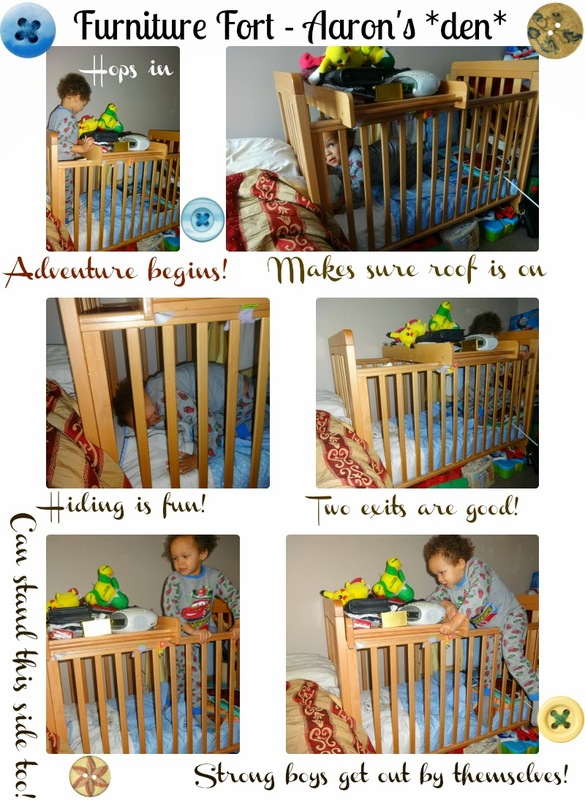 As he never sleeps in his cot, that WAS full of clutter too, which is why it was SUCH a novelty for him to hop in when he saw it clear and empty. My boy loves nothing more than climbing even when indoors bless him. As active as a whippet.